Enjoy expansive views from this beautifully updated corner unit's extended, screened in balcony overlooking the waterways and barrier islands. Light and bright shades of blue decor compliment the clean, high end finishes of tile throughout, crown molding, granite countertops and designer bathrooms. The master bedroom offers a king size bed with direct balcony access and an elegantly updated en suite bathroom with walk in shower. The guest bedroom offers one double and one twin size bed with an additional sleeping accommodation of a pull out sleeper sofa in the living room. 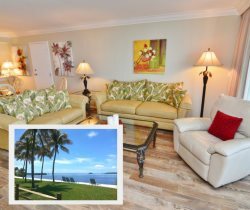 This Sanibel Harbour vacation rental has space for the whole family with comforts of home. It was a perfect place to vacation. We could easily go to Sanibel Island or Ft. Meyers. We loved the private beach and pool, and we saw dolphins from the condo daily. Overall, a great place to stay and wonderful vacation.